Napoleon is about to take off for Australia. His portrait (after Antoine-Jean Gros) is heading for Wolumla near Bega in New South Wales. Our Alliance Francaise de la cote de saphire!! 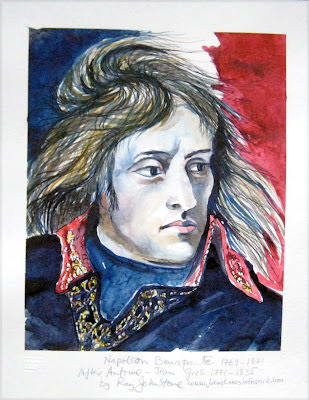 are having our annual Bastille dinner, it is the big night on our calendar. I am on the sub committee. Our theme this year is Personage de France, so everybody comes looking like Napoleon or if your really ugly Charles de Gaulle. Anyway, (I'm getting to it). What do you think of this idea? Would it be possible for you to donate a painting for the prize? The alliance would frame it and of course it would be publicity for your gite etc. We would have it displayed with all your advertising blurb accompanying it. You can say no, I haven't discussed it in commitee yet! Ian wanted to paint a self portrait, which is usually quite a challenge. ... starting with a drawn and then painted outline of his head and shoulders on a black ground. ... and eventually, after about eight hours hard yakka, he got to the end product. This is Ian with his own self portrait. This is Ian's watercolour painting of Larressingle, the nearby tiny medieval village near the well-known town of Condom. My French petanque playing mates often ask me why English speaking people are always having their photographs taken at the road signs outside of Condom. This is because condom is meaningless in French - they use préservatif, which is, in turn, a strange concept in English. Fources in the Gers is a round bastide village dating from Medieval times. 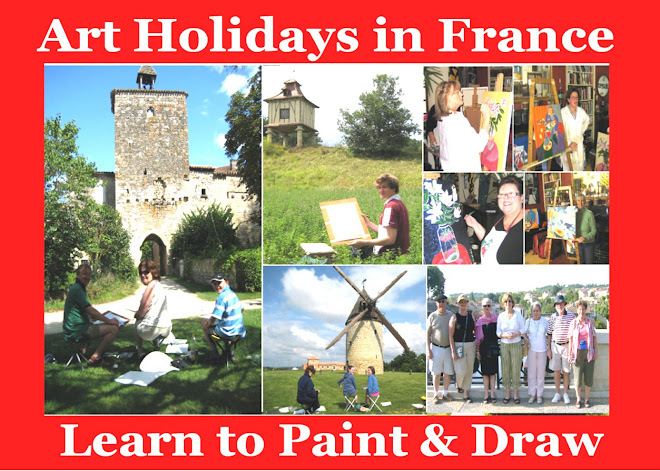 It's always on the agenda for watercolourists who come to do a painting course at La Petite Galerie in Mézin. 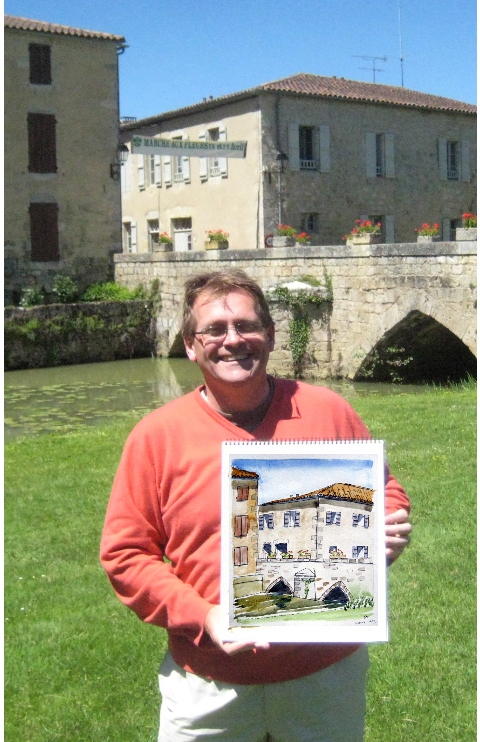 This is Ian after a morning's painting en plein air. Greetings cards in English can sometimes be a little difficult to find in France. Ian wanted one to send to his daughter to wish her good luck for her GCEs. Solution: paint one. This is Ian from Cornwall who is doing what Oliver Cromwell insisted that all portraitists should aspire to - paint, in this case draw, the subject "warts and all." Ian and Ray in the garden and a detail of the final result below. Ian is at La Petite Galerie for a week, so watch this space for further developments.